Don't get too excited, this blog is short and sweet. I noticed not many of you have seen the Tape Measure Shot cards, so I decided to scan them for you all to see. I bought one pack pack and it guarantees 2 of these cards per rack pack. All that was in the rack pack were the 2 Tape Measure Shots, and a Biography card. The rest were base cards so I'm not scanning those since we have all seen them already. 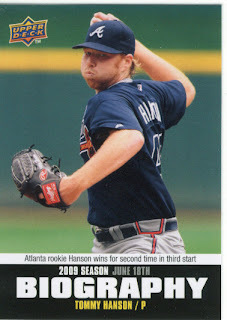 I still have to show you guys what I got in the pack from the hobby shop the other day. Well worth driving down there for it. 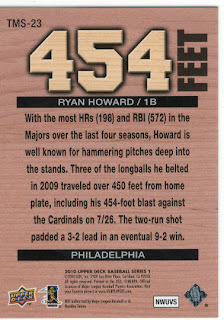 Ryan Howard hits a Homer in a Home game v the Cards. The picture of the game is from an away game v the Mets. Brandon Inge pictured in home whites for a HR hit in Ontario and Carlos Pena pictured in Busch Stadium for a HR hit in St. Petersburg. I gotta say those Tape Measure cards are nice looking. How much are those rack packs? I should have included the price. They are $4.99 in Target and I can bet they are higher in places like Toys R Us and Sports Authority. And good points on the photos, I didn't even look at the pictures that closely. 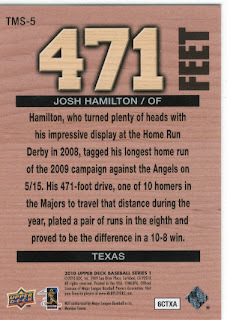 Those tape measure shots would look pretty cool as bat cards. Those 2 tape measure cards are the exact same 2 I featured on my blog, as well as the same 2 that I saw on Heartbreaking Cards' blog. If it wasn't for Roy's comment I'd start to think those were the only ones they made. LOL @nightowl. Clearly I need to brush up on my daily reading lately. I saw a bunch of comments on twitter that people didn't know what these looked like so I just threw 'em up. I dunno, I still think Topps did better with inserts this year but both have awful base designs (in this wombat's humble opinion). I do like the die cuts in UD though.